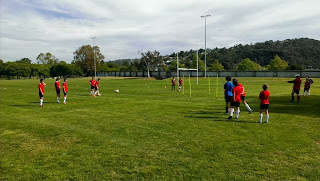 LCDDS has now been in place for 2 years and the youth squad continues to train on Tuesday afternoons at Royal Park in central Launceston. A squad of 16 players attend the weekly training session which is conducted by LCFC Head Coach, Kurt Reynolds, who is an FFA accredited Skill Acquisition Trainer & A Licence coach. 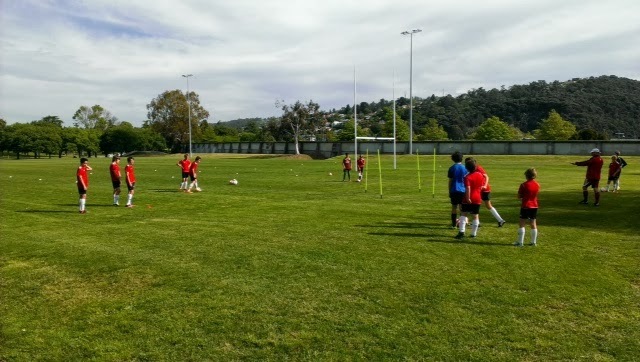 An initiative of the Westside Devils Junior Soccer Club and in conjunction with Victory League club Launceston City FC, the program has grown to include over 40 players throughout the season. "It is fantastic that the clubs have taken this initiative and have the vision to grow the development program in the future." 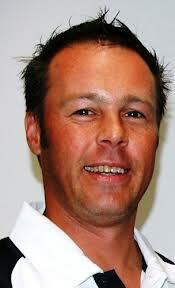 commented LCDDS Head Coach, Kurt Reynolds. 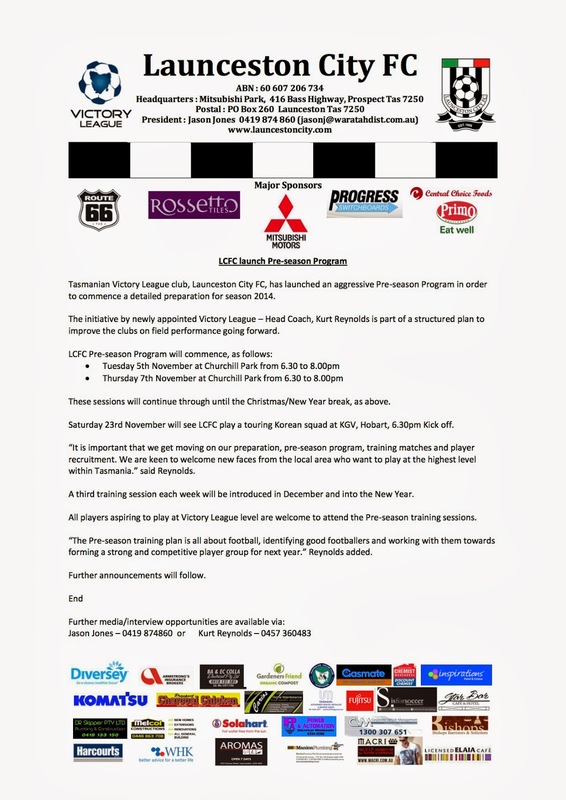 The program is totally aligned with the FFA National Football Curriculum and is a clear indications of Launceston City FC's commitment to embrace a strong junior and youth development policy relative to it's Victory League status. LCDDS committee members are committed to building on the quality of the program, the facilities and package provided and most importantly the football content. The program is open to all aspiring young footballers in northern Tasmania and is part of a clear pathway for young players to play at the highest level in the state.
" Our objective is to provide the highest quality Development Squad in the state. This is a very professionally run product with the absolute focus on the football content. We are seeing significant advancement in the players technical abilities from this program". added Reynolds. WESTSIDE - CLUB OF THE YEAR 2013! WESTSIDE DEVILS JSC WON CLUB OF THE YEAR 2013!! highest level over the 2013 Season both on and off the field. Launceston City Devils Development Squad. our players are coached by the best in the North of the State. into their 20's and beyond. who all help to make Westside Devils the great club it is. Westside Devils to kit out our teams in the Adidas Strip. to play to the best of their ability. All players involved in the 2013 Victory League squad, the NPL squad and the U18 squad are welcome to attend. Numerous new players to the club will also be in attendance. It is important that any player aspiring to be selected in the LCFC Victory League squad attend the full component of training and training matches provided between now and season commencement. A similar program of training beyond this date will continue until week ending 20th of December where a 10-12 day pause in training will take place over the Christmas/new year period. The LCFC Victory League squad for 2014 will be selected and announced in mid March 2014. 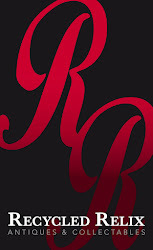 Click on to enlarge image. Please only train on the bottom pitch -we do not hire the top pitch and there are 7 games to be played on it this weekend. Please ensure players stay out of wet patches to allow them time to drain. Due to over 50ml of rain received the grounds are unplayable. Coaches please organise alternative sites in need. 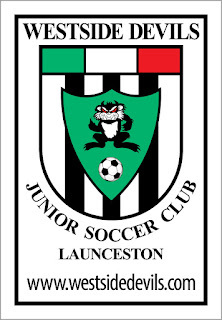 Launceston City Devils Development Squad training will be held in the Summerdale Primary School Hall again Monday 19th August 2013. Please ensure you wear joggers or futsal shoes and bring a water bottle. Due to water logged grounds - Churchill Park is closed. MITSUBISHI PARK IS CLOSED FOR THE REST OF THE WEEK. There will be no training on the grounds. Please note Meander Valley Council will check the grounds again tomorrow. 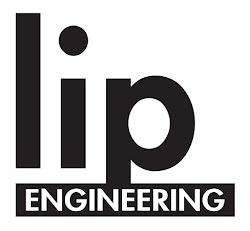 Due to anticipated closure of Mitsubishi Park due to rain the LCDDS training will be held in Summerdale Primary School Hall Monday 12th August 2013 from 4.30pm to 6pm. Please note all participants will need to wear joggers or futsal shoes and bring a water bottle. You cannot train in soccer boots. It will be a combined training session from 4.30 - 6.30pm. If you have not registered for this semester still come along and register - the semester fee is $50.00. MITSUBISHI PARK IS CLOSED FOR THE REMAINDER OF THE WEEK - NO TRAINING TO BE HELD ON THESE GROUNDS. THE NTJSA HAS ADVISED THAT THE CHURCHILL PARK GROUNDS ARE CLOSED (BY THE COUNCIL) DUE TO THE RAIN RECEIVED. THEREFORE THERE WILL BE NO TRAINING AT THE CHURCHILL PARK COMPLEX EITHER - SO NO REPRESENTATIVE TRAINING. Meander Valley Council have advised that due to rain received the grounds are closed - they will be reassessed Wednesday lunch time. After being there last night I would expect they will remain closed for the week. The NTJSA have advised that the Council have closed Churchill Park. Therefore there will be no games played tonight or tomorrow. Please note the Launceston City Devils Development Squad will resume training this Monday 5th August. If it is raining and the grounds are closed there will be a combined training session for both age groups between 4.30 and 5.30pm in the clubrooms Mitsubishi Park. The Grassroots Coaching Course will still take place from 7pm in the clubrooms Mitsubishi Park. Mitsubishi Park will be reassessed Thursday morning by Meander Valley Council. MITSUBISHI PARK IS CLOSED UNTIL WEDNESDAY - WHEN IT WILL BE REVIEWED. MItsubishi Park is closed until at least Wednesday due to rain we received overnight. There is every chance that it will be closed for the rest of the week if we get more rain. Coaches please look to using alternative grounds or even try boxing behind the Italian Club - Call Simon Tennant 0408 183 851. Launceston City Devils Development Squad is therefore cancelled for tonight and will start again next Monday. 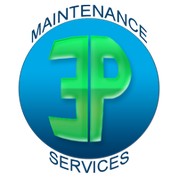 LCDDS will try to locate an alternative site (like Prospect High Gym) next Monday if it is still raining. Churchill Park is closed to all users this week too but will hopefully be right to go on the weekend. train in and wear to the game. 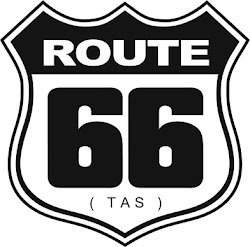 Route 66, 143 Charles St, Launceston. and wear your Jacket with pride! NB. The 16 is like a small mens so suitable for Mums & Dads & Coaches too! Coaches if you plan to train this week you will need to find another venue. 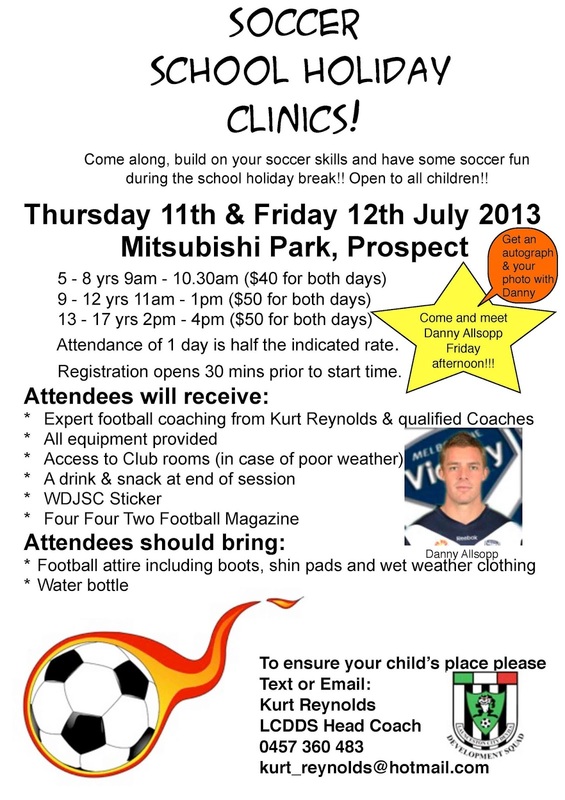 Please let your players know that training will not be at Mitsubishi Park. For those of you wanting to come along to the session to meet Danny Allsopp - please note we have changed the session to run from 12pm to 2pm (and probably 15 - 20 minutes longer) to fit in with the Media who will be attending late in the session. If you are only attending this session - it is $25 per player. So come along and meet Danny and get his autograph! 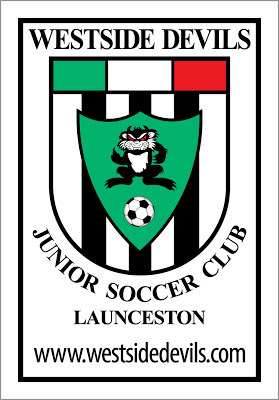 & our senior club Launceston City FC. 2 - 4pm Soccer Clinic on Friday 12th July. where you will hear from Danny Allsopp &Kurt Reynolds. $10 entry fee includes finger food. Should be a cracker of a night! Come along - all welcome! in the V League match against Northern Rangers. If you only get to one V League match this year - make it this one!! Wear your Black & White - free entry for Westside families. 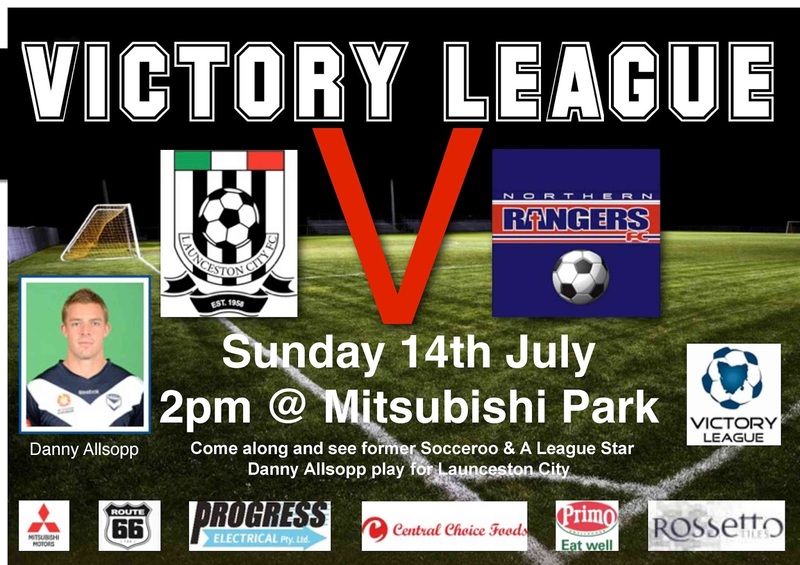 Sunday 2nd June, 2pm kick off Mitsubishi Park!! If you want to be a Ball Boy/Girl come dressed in your playing strip and let me know ASAP to secure your spot! Launceston City FC how good your goal shooting is!! It will be "Last Man Standing" with the winner taking home a prize from Launceston City FC. Remember free ground entry for Westside Devils Family's - wear your Black & White! through the Launceston City Devils Development Squad. 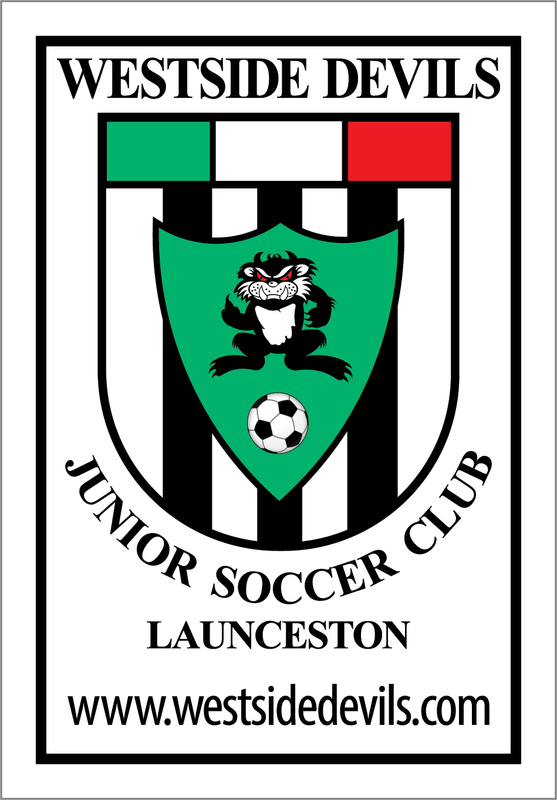 Launceston City FC are the largest soccer club in northern Tasmania. 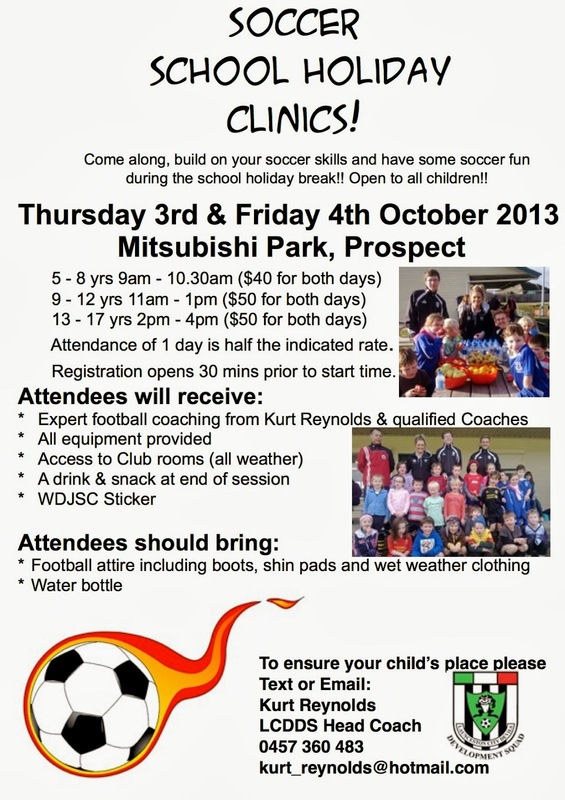 The club is based at Mitsubishi Park, Prospect. commented Austin Fagan, committee member. the National Football Curriculum content and Skill acquisition training. The program currently caters for players aged from 9 to 16 . 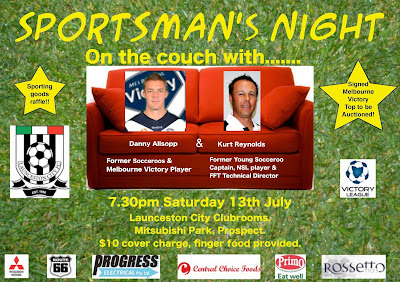 Victory League with the Launceston City senior club. completing his FFA A Licence. are closed due to the rain. Committee Meeting Monday 13th May 7.30pm in Clubrooms! NTJSA have advised that the soccer roster for all those not playing McDonalds Cup i.e. U6 to U11 should be out by Wednesday evening. You will be able to view at www.ntjsa.org.au or through Sporting Pulse. 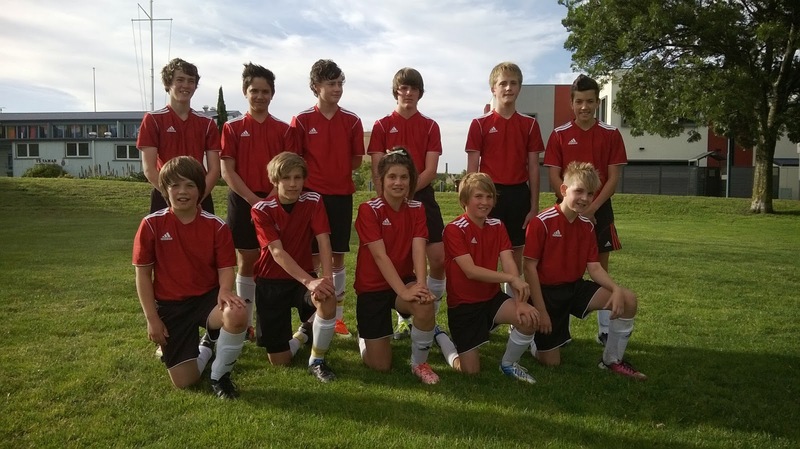 Westside Devils Players walked out with the Launceston City FC Victory League Team on Saturday. It was a great day and good to see so many Westside Devils Players and family attend. Westside has the opportunity to do it again this Saturday and also play small sided games at half time. Kick off this week against Kingsborough is at 2pm Saturday 30th March. Westside Devils Celebrate Victory League Opening Double Header! Victory League game of the season. or your Westside Colors or Car Sticker. 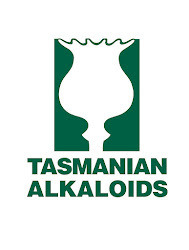 held by Football Federation Tasmania. for our Victory League Team! GROUNDS CLOSED TODAY 21/3 - DUE TO RAIN! so there will not be any training today. Coaches please notify your players in need. We need 13,14,15 & 16 year old BOYS!! We have a few positions available in our U14 and U16 teams. So if you would like to play soccer for Westside Devils now is your chance! to ensure there is a place for your child. in our clubrooms Mitsubishi Park. Team Strips, Balls and Equipment will be given out. You are welcome to email any items you wish to discuss prior. It is important to attend this meeting. If you can't make it please contact either Louise Lucas 0418 322 854 (if you have any team/player issues) or Mick Egan 0409 234 603 (if you can't make it - to arrange another time to complete/collect all the above). It will be a quick meeting as we will have a Committee Meeting straight after. Last Registration Day - this Saturday 23rd 10 am - 3 pm! from 10 am to 3 pm. or come into the clubrooms this Saturday. and pay the fees later (before the end of April). Cathy Hancox 0400 505 555. Registration Day this Saturday 16th Feb 10am - 3pm - be there! Saturday 16th February 2013 from 10 am to 3 pm. MasterCard, Visa, Cash or Cheque. to purchase for $20 and $10 respectively. your son/daughter try the program before you sign up. or see one of the Committee. - so make sure you get your pack! Westside Devils .... your path to the Victory League! Our first Registration Day is this Saturday! Saturday 9th February 2013 from 10 am to 3 pm. The uniform Adidas Shorts and Socks will be available to purchase for $20 and $10 respectively. be taking registrations and you are encouraged to have your son/daughter try the program before you sign up. Westside Devils .... your path to Victory! You can register NOW - online registrations are open!! 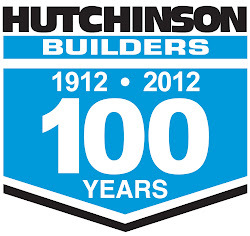 are now taking registrations for the 2013 Season! to a fantastic 2013 season. Westside Devils - your path to Victory! We are nearly ready to go live with Online Registrations! Just waiting on final adjustments by FFT and it will be all systems go. Season 2013 is nearly upon us! If you still have a Playing Top from last year - we need them returned NOW! You can drop them into our shop Recycled Relix, Cnr York & Bathurst Sts, Launceston M-F 10 am - 4 pm and S & S 11 am - 4 pm. Coaches if you have your team tops or balls and equipment can you please confirm this ASAP by return email. Coaches please confirm that you wish to coach again by return email - also if there is anyone who wants to coach in 2013 please send through your details ASAP. All Coaches require a current police check - this is free - forms are available at your local police station - please get this underway now. FFT is running a Skills Acquisition Program at Churchill Park Saturday 2nd & Sunday 3rd February from 9 am - 4 pm daily (free of charge). You need to bring: Football apparel, Water, Lunch, Notepad & Pen, Sunscreen & hat. The course will include a combination of theory and practical modules in line with the National Curriculum. This course is open to all Coaches - including Junior and Development Squad Coaches - for further information or to register please call Blaise Fagan from FFT on 0427 893 752. Go to www.ntjsa.org.au for more details in due course. Online registration will commence 1st February - watch our website www.westsidedevils.com for further details. We can accept children who turn 5 through to 17 in 2013 to play the great game. Registration fees for 2013 are $145 for the first child and $135 for each additional family member. The fee increase covers the rise in cost of the Meander Valley Council Ground Hire, Rates & Insurance for our clubrooms and Electricity. We will hold three registration days in February - Saturdays 9th, 16th & 23rd - 10 am till 3 pm each day. We need volunteers who wish to help on these days - we need at least another 2 or 3 wireless laptops for people to use. Westside Devils is the club to be with in 2013 - tell your friends! 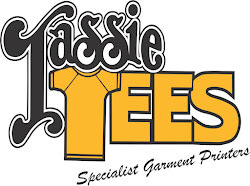 The first term starts 4th February and finishes 19th April - first term cost is $80.00. We welcome all players aged 9 and older to train on Monday nights in two sessions U12's 4.30 pm - 5.30 pm and U14's and older 5.30 pm - 6.30 pm. Training will be at St Patrick's College cricket grounds. Contact Peter Ryan on 0447 363 948 or Paul Mischis on 0418 673 990 for further information. The Victory League starts with a HUGE Double Header at Mitsubishi Park 23rd March 2013 - put this in your diary now!! 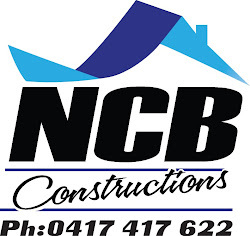 Devonport Vs Zebras at 1 pm and Launceston City Vs Northern Rangers at 3pm. This will be a great day and we would like you all to attend - it will a Black and White theme - further information will be sent out soon! Here's to a great 2013 Season!